James Bond, special estate agent with a licence to sell. If, while James Bond is busy saving the world, you’re more interested in the gorgeous houses and gardens behind him, you really should be buying a home in Italy. 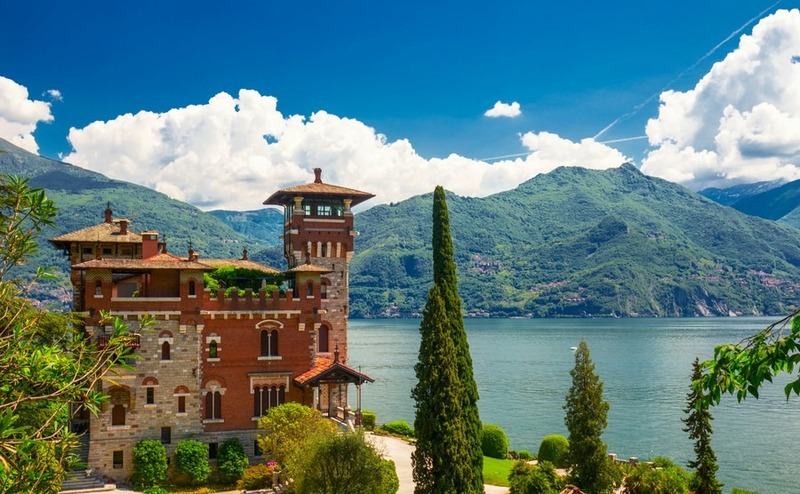 Here are the top five Italian mountain, canal and lakeside properties from the Bond movies. Pssst, one is for sale, but don’t tell the Russians! One of the highlights of James Bond movies are the glamorous film locations, and these have included some stunning Italian scenery and buildings over the years. 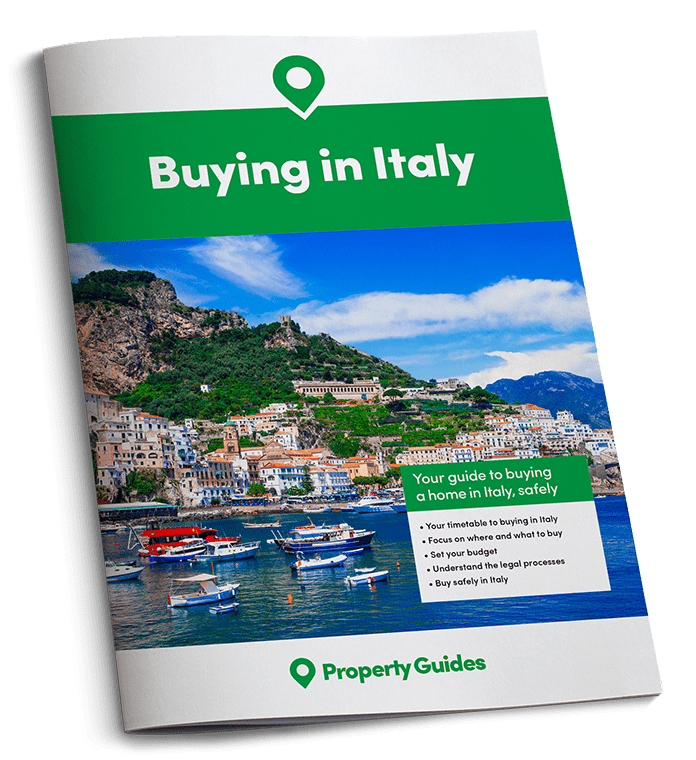 How amazing would it be to actually live in one of those locations, to sit in the garden of an elegant villa overlooking lake Como, cruise round the canals of Venice or ski down the slopes of Cortina d’Ampezzo! Here are the Top Five James Bond Locations in Italy. One of the highlights of James Bond movies are the glamorous film locations, and these have included some stunning Italian scenery and buildings over the years. Lake Como has been a popular tourist area from as far back as the Romans, and visitors still flock there to enjoy the relaxing lake and mountain views. In “Casino Royale”, James Bond, played by Daniel Craig, convalesces at Villa Balbianello near the village of Lenno. 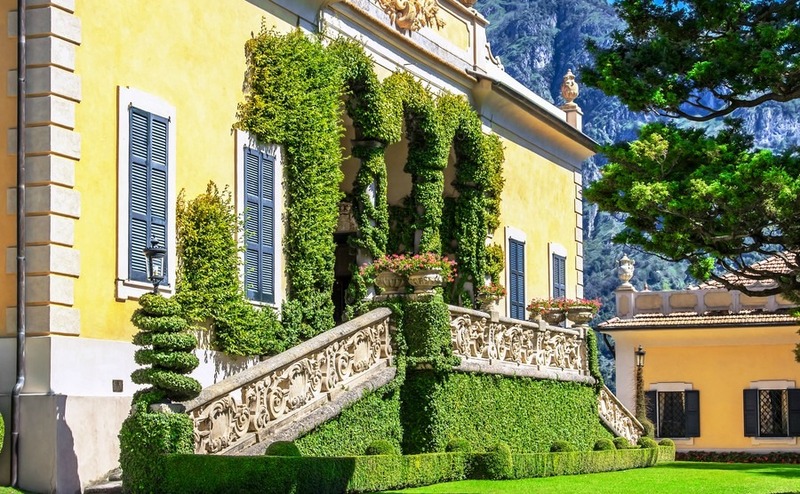 This elegant house is just across the lake from Bellagio on a large promontory with terraced gardens leading up to an impressive Loggia fronted by three stone arches. Bond is seen sitting in the beautiful garden overlooking the lake. For an entrance fee you can also enjoy a few hours at Villa Balbianello, taking in the views and visiting the house. The property is under the care of the FAI (Fondo Ambiente Italiano). Inspired by the National Trust in Britain, the FAI aim to protect special places for future generations to enjoy. National Trust Members even get discounted entry at Villa Balbianello. You can see this house and other protected buildings on their website. At the end of Casino Royale, Bond also goes to Villa La Gaeta, near San Siro and Menaggio. This villa also has a beautiful garden overlooking Lake Como, with a private mooring and beach. The house is divided into apartments that can be rented for holidays. For around £136 a night you can stay in a one-bedroom apartment in stunning surroundings. Details are on Owners Direct. If you would like to buy a three-bedroom apartment right on the lake you’ll need in the region of €800,000, but it is still possible to buy one bedroom apartments further back from the water’s edge with lake views for around €160,000. When a romantic location is required, where better than the canals of Venice. In “From Russia with Love” the closing shot is of 007, played by Sean Connery, cruising under the Bridge of Sighs in Venice with his Bond girl. This was in 1963, and 43 years later Bond was back in Venice, this time with Daniel Craig sailing his yacht with Vesper, along the Grand Canal between the Accademia and Rialto bridges. Fortunately, the Palazzo that collapses in the film is in fact still standing! You might think Venice will be out of any sensible budget, but you can in fact find small apartments costing less than €250,000. For a two-bedroom apartment in a good location you should look to spend around €400,000. It will, of course, have enormous potential for rental especially if a quiet apartment with a terrace and canal view, close to shops and restaurants. One mountain chalet has come up for sale that claims to have been used in the 1981 film “For Your Eyes Only” starring Roger Moore as “007”, Carole Bouquet as the film’s Bond girl, and Lynn-Holly Johnson as the pretty young blond ice-skater. It’s the one where Bond goes down the Olympic ski jump. The property also boasts having had house guests such as Ernest Hemingway, Elizabeth Taylor and Richard Burton, and it even appeared in The Pink Panther in 1963. 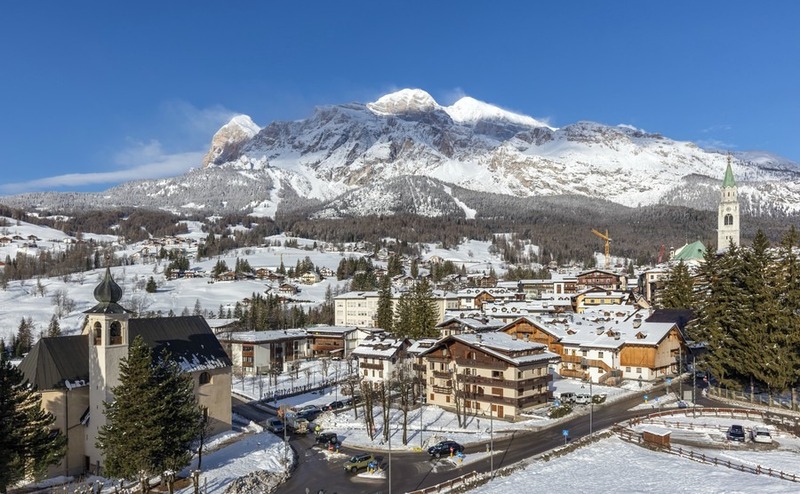 This large ski chalet has views of the Dolomites all around it, enabling the owners to put on their skis and go directly out onto the slopes of Cortina d’Ampezzo (Contact the Realtor Andrian and Partners for details). On and off the set James Bond and Roger Moore stayed at the Miramonti Grande Majestic Hotel about a mile outside the town of Cortina d’Ampezzo. The town square, ice rink, ski jump, and Bobsleigh run also feature in the film. This stylish alpine resort is surrounded by magnificent scenery and has recently been chosen to host the 2021 Alpine Ski World Championships. There are apartments for sale in the town advertised on Rightmove Overseas priced from €650,000. In the film “Spectre”, various locations in Rome were used, such as the entrances of the Garibaldi Museum and the Museum of Roman Civilization. A car chase goes through the city streets, passing St Peters Square, down the steps of the Scalo De Pinedo and along the bank of the River Tiber. In “Spectre” Bond is also seen following Lucia back to her home following her husband’s funeral. This is Villa di Fiorano on the Appian Way (Via Appia Antica), the ancient Roman road that stretched all the way to the port town of Brindisi in Puglia. This stylish location has extensive grounds and can be hired for wedding receptions and events. It is in a very exclusive area with many luxury villas within easy commuting distance of Rome city centre. When a property does come up for sale you can expect to pay grand prices. In the film “The Spy Who Loved Me” (1977), Bond stays at Hotel Cala Di Volpe near Porto Cervo on the Italian island of Sardinia. This luxury 5-star hotel looks much the same today and asks top rates for rooms with a view over the beautiful coastline of this Mediterranean paradise. Popular with the rich and famous, Porto Cervo has one-bedroom apartments for sale on Rightmove Overseas starting at around €300,000, but there are also three-bedroom apartments in the area for over €1 million. In contrast, there are inland villages on the Island that have town houses and renovation projects on offer for less than €100,000, many of which are only a 15-minute drive from the sea. Whichever James Bond film location you decide to visit, I hope you won’t be speeding through the streets after bad guys. Instead relax and enjoy the view with a glass of Italian Martini. Shaken, not stirred, of course.